Discussion anyone here interested in practicing Pureland Buddhism? anyone here interested in practicing Pureland Buddhism? I am interested in Pureland Buddhism. Now whenever i have nightmare-ish kind of dream where i am afraid for my life, in the dream, i suddenly remember to chant Amida Buddha's name and chant for 5 or 6 times and I end up waking up from the dream. I recite the Tara Mantra. But that's before I fall asleep. It relaxes my thoughts, eliminates negativity and I enter into sleep in a good frame of Mind. Perhaps recitation of Amida Buddha would do the same for you and prevent such nightmares occurring in the first place....? So is chanting the main practice in Pureland? What about other practices? Yeah I was all attracted to the idea of the ability to purify or plant seeds of enlightenment in the 8th sense when i first heard about it. Not sure what you mean by elaborate on the notion? not sure what notion you're refering to. I learn mostly everything from youtube videos. They say that each time you chant Amida Buddha's name, you put inside your 8th sense a seed of enlightenment... your 8th sense works all the time between life and death and lifetimes. My uncle also explained to me that your 7th sense takes whatever you do/think and puts it in the 8th sense (like a memory bank) and at the same time take something from the 8th sense and brings it out. As i understand it, this is how karma works, if you do something bad the 7th sense takes it and stores it in the 8th sense. if you do something good the 7th sense takes it and stores it in the 8th sense...so if all you think/do are all bad, you plant many bad seeds for your future (times/lives). But chanting Amida Buddha's name, it's a sound/thought representation of Amida Buddha which represents infinitely light and infinite life which plants the seed of enlightenment. As you slowly fill up your 8th sense with thoughts of Amida Buddha, your 8th sense become more purified... some monks explained that our average 8th sense is filled with good and bad seeds, but as you chant more your 8th sense become not sure how to translate "Bach Tinh Thuc" into English but Bach means White, Tinh means free from noise, and Thuc means sense or consciousness. Google translated it as Pure White Consciousness. Other videos explain the process in which if you do a lot of chanting, at some point you'll start hearing these chants, they originate from your 8th sense, they even say that if you continue you'll hear these chants when you're not chanting, and that whenever you don't hear these chants, you chant to make it continuous. at some point you'll hear these chants continuously while awake or dreaming. I know this hearing of chants to be true because years ago when I used to live in Calgary, I would play a CD of the chanting of the word "OM" in my car while driving after sometime i don't know how long, some nights i come home late as i open the door to the house, I would hear "OM" chanting, which to me was louder than the hum of city sound. Some other monk was explaining that people who chant often... will start to remember to chant whenever they feel threatened...So that's why i mentioned about me dreaming having nightmares..it means it's having an effect as described by the monk. @tintran, thanks for the explanation regarding the 7th and 8th senses. I did not know about this. Need more learning and more chanting :-). I am not good with mediation, so I started to dig into Pure land Buddhism for a few months now, mainly from the web. So I am very interested. I try to follow Master Chin Kung (https://en.wikipedia.org/wiki/Chin_Kung)'s teachings. 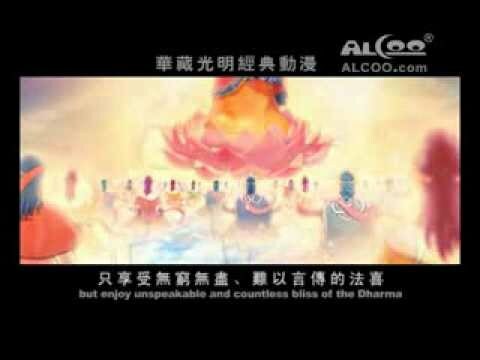 We can chant/recite the Amitabha Buddha name anytime, anywhere, any situation. For those who are interested in a simple chanting/recite Amitabha Buddha name practice. My chant is 'Nam-myoho-renge-kyo'. I prefer my Buddhas a bit closer to home. Amida Buddha is said to preside over the distant Eastern realm of the universe while Sakyamuni taught in this realm of the universe. The Pure Land teaches that, if you correctly practice that teaching, you will be reborn in the Eastern realm and then be able to achieve enlightenment there with Amita (sometimes pronounced Amida) Buddha. In adhering to the Lotus Sutra, we can/will achieve enlightenment in this lifetime as we are. I promised to be nice when I joined this group, so I will engage in a 'shoot out'. If you feel it helps you, then I certainly won't be the demon waving the iron staff today. As another monk explained it doesn't matter what language we chanted in, it's like calling a glass in different languages but to us it means the same thing in thought that's what matters. What's important is when we chant, try to focus on the chant and not think about other distracting thoughts. My mind still wanders a lot when i chant so out of 100 chants, maybe 3 of them or 4 of them, i have my mind focused on the chant. with the others, i always have some other sort of story going on my head. I have seen videos of translated/dubbed chinese cartoons that tell stories and they all refer to Amida Buddha as being in the Western realm... but they say that there are what seems like uncountable realms of Buddhas, and that before Amida Buddha became Buddha, he went and visit all these realms before he built his Western realm, and that the condition there is well suited for people to achieve enlightenment and that all other Buddha also speak of Amida Buddha just as our historical Buddha (Gautama) spoke of Amida Buddha. I tend to think of chanting as one of a range of techniques. I still chant to Amitabha on occasion. Chanting Amitabha can be amazing. I was once challenged to lay study down for a year and immerse myself in the chanting only. After one year I returned to formal study. What a difference. So much that was hidden now was revealed. @ tintran. Amitabha is associated with the Western Paradise.On his left is Avalokitesvara. On his right is Mahasthamaprapta. In addition are the visualizations based upon the ability of the practitioner. You are right, it was the Western realm. I really enjoy this story as it tells about the effect of planting karmic seeds in your 8th sense. The Monk who was a hunter. In the video there's a short story about planting karmic seeds from the time of Buddha. During Buddha's time. There was this man who wanted to become a monk and join the monastery. He went the the monastery and asked the head monks to shave his head so that he can become a monk. Buddha wasn't there, he was out. The head monks would use their insights to see the past 80 lives of this man and saw that this man did not plant any karmic seeds with Buddhism in his 80 lives so they told the man to leave. The man was very disappointed and sad. As he left, he was thinking of dying. So he decided that he would run and smash his head against the rocks and die. But before he did this, Buddha was returning and ran into him and asked him why he's so sad and wanted to die. He told Buddha his story, and Buddha used his insights and saw his past lives and told the man to come back with Buddha to get his head shaved to become a monk. When Buddha got back to the monastery, the head monks were surprised to see the man coming with Buddha and told Buddha that they have already used their insights to see that this man has no karmic seeds with Buddhism. Buddha told them, you've seen his past 80 lives but have not seen his past 81 lives. Buddha continued and told them that 81 lives ago, this man was hunter and one day in the forest while hunting, he ran into a tiger and was chased by the tiger. The man was so afraid of the tiger, he climbed up a tree while the tiger was waiting down below. The man remembered people saying that chanting "Buddha" plants good karmic seeds, he was so afraid even though he didn't believe in Buddha, he was desperate enough to try so he started chanting "Buddha, Buddha ...". After repeating this chant for a while the tiger lost interest in the hunter and left. Because of this chanting, he planted karmic seeds with Buddhism. And so he shall be monk. After joining the monastery, this man achieved some form of enlightenment and became an arhata. The moral of the story is that even a person who doesn't believe in Buddha or Buddhism if recite Buddha's name will effectively plant karmic seeds which leads to enlightenment in the future. Now imagine the effect if we wholeheartedly recite Buddha's name. Me too. In fact all forms of Dharma! 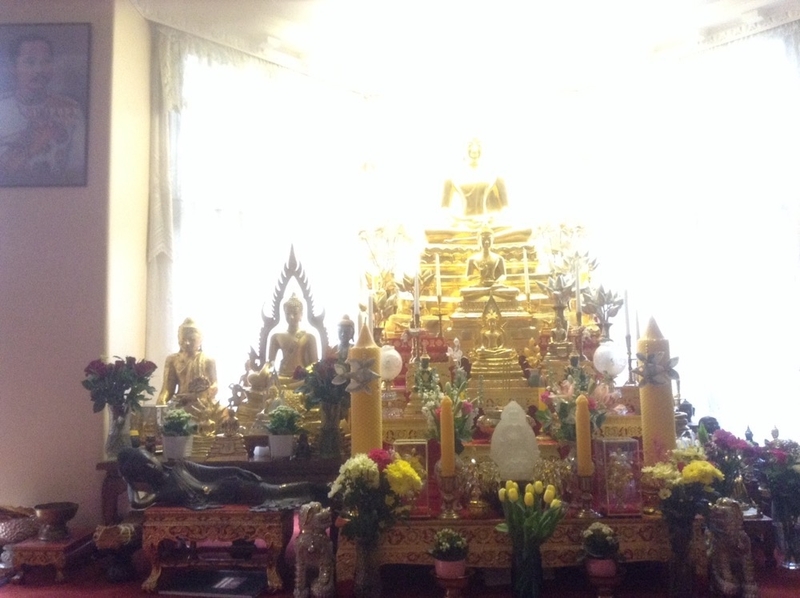 One of the temples I visit is dedicated to Amitaba. The wonderful thing about the practice is you can visit other traditions and still chant 'Namo Amitaba'. Pureland technique is sometimes taught by Zen teachers, which is always a good sign of usefulness. yeah, some monks were saying that even Bodhisattvas practice chanting Amida's name too. And that the practice can be practiced by all types of people. Pure Pureland is for me like living in a bubble. 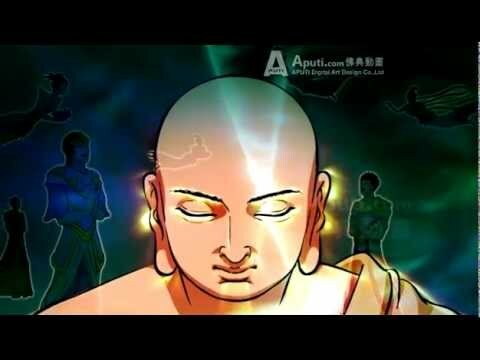 Found these three animation sutra videos by Master Hai Tao with English sub. All these three sutra are about the Amitable Buddha and his Western PureLand. @tintran, you may have seen these already.